Raw Cultured Vegetables make a delicious, revitalizing snack which many people around the world enjoy. But to get the most out of our Kim-Chi, Raw Sauerkraut, Live Pickles and other Raw Cultured Vegetable products, combine them with other foods! As garnishes or side dishes, they convey improved flavor, health and nutrition to all foods. You'll Love the Amazing Zing! 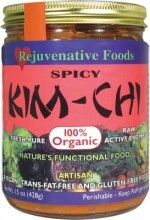 Raw Cultured Vegetables are fermented using beneficial live microflora found in all vegetables. The fermentation produces acid which, like a splash of lemon juice or vinegar, helps to give Raw Cultured Vegetables that Amazing Zing. But Raw Cultured Vegetables are also very rich in enzymes: natural compunds which speed up vital chemical reactions. These enzymes literally catalyze the natural flavor sensation of any food they combine with. This is no mistake. Your body knows what is good. Enzyme-rich foods are delicious for a reason. What Are Raw Cultured Vegetables? The technology of making Raw Cultured Vegetables is ancient. Raw live vegetables are shredded or ground, and then allowed to ferment under controlled conditions. Fermentation takes about seven days. At that point, refrigeration stops the fermentation process but leaves the food alive. The acid produced by living microflora helps to preserve the food. Today, Raw Cultured Vegetables can be refrigerated for up to 6 months without losing their food value. There are two basic ways to prepare starch for human digestion. One is cooking. Heat does the trick. The other way is fermentation. The big advantage of fermentation is that it leaves the food alive and enzymes intact. Don't heat Raw Cultured Vegetables. Don't use them in a stew. Use them unheated, as a garnish or a side dish. Then the flavor will shine through! Rich in enzymes and the beneficial microflora lactobacillus plantarum and lactobacillus acidophilus, Raw Cultured Vegetables have substantial benefits for nutrition and overall health. A healthy balance of microorganisms in the digestive tract is crucial to overall health. One common imbalance is overgrowth of the yeast, candida albicans, which can cause various behavioral and health issues. Raw Cultured Vegetables help to restore balance by introducing beneficial microflora which keep the yeast in check. This has proven beneficial in cases of peptic ulcers, ulcerative colitis, colic, constipation, stomach-aches and other digestive disorders. Even some food allergies can be overcome by establishing a healthy balance which normalizes the immune system. Raw Cultured Vegetables are also rich in enzymes, which not only improve the flavor of food but also help to improve digestion. The pancreas is your body's main source of enzymes. Eating enzyme-rich food gives your pancreas a well-deserved rest. Some time ago I was having severe problems with Candida Albicans, causing severe heart palpitations - variously diagnosed as tachycardia, premature ventricular contraction, prolapsed mitral valve, etc. I resorted to drastic methods to try to eliminate the candida including nystatin and various natural products, for about 6 -8 months without satisfactory results...One day I read a testimony by a man who overcame candida with Raw Sauerkraut. After I had eaten about 7 jars of the stuff- which by the way I liked - after about two weeks my heart palpitations vanished. I had too much of a hearty growth of the candida albicans yeast in my whole system, which I worked hard for one year to get under control. After using your Raw Sauerkraut for one month, I had the yeast under control and am feeling so much healthier in every way. Many different microorganisms, present in nature, are found in all vegetables. In cabbage, these organisms mostly stay on the surface of the leaf. But if cabbage leaves are ground up, this exposes the inner part of the leaf for bacterial colonization. Left at room temperature, the ground-up cabbage will soon be permeated with leuconostoc mesenteroides, which lowers the pH to a more acidic environment. In this environment, the lactobacillus acidophilus and lactobacillus plantarum thrive. They rapidly produce enzymes which convert sugars and starches into more lactic and acetic acid. These acids now act as preservatives, discouraging harmful bacteria and mold. After six days of fermentation, the conversion process "peaks" and the microflora begin to dwindle. Under refrigeration, the conversion process continues more slowly. Thus Raw Cultured Vegetables retain their nutrition, flavor, and health benefits. Either on their own as a revitalizing snack or as an enriching garnish consumed on the same spoon with other foods, many people love the live zing taste sensations of various combinations of Raw Cultured Vegetables. This article offers an understanding about how the intrinsic life energy in Raw Cultured Vegetables creates a phenomena, when consumed, of actually enticing and enhancing the release of naturally present flavors as well as the nutritional benefits of most foods that the Raw Cultured Vegetables are eaten with. Fresh Raw Cultured Vegetables, in their creation and existence (as a refrigerated food taking part in an ongoing self-perpetuating culturing process) and as they are being consumed, do and are doing almost the same thing as our body's assimilation system. Because assimilation is being initiated sooner, the flavors of all the foods are released sooner and in a more complete and healthful way. They actually bring out the flavors in foods. Raw Cultured Vegetables are an exceptional garnish to enhance just about all foods with an exotic live zing taste sensation and this unique food is a natural enhancement to the human assimilation process. Raw Cultured Vegetables are unheated, cultured (which refers to the fermentation process) vegetables that have been either cut, ground, or shredded and left in a sanitary container for a about a 7 day period at a temperature maintained in the range of 59º to 71º. This process allows for the proliferation of lactobacilli (healthful micro-flora that are naturally present in vegetables and also in our digestive tract), which break down the sugars and starches found in the vegetables, aiding the pancreas and intestines in proper digestion. The difference between Raw Cultured Vegetables and commercially available heated sauerkrauts is that the in a heated sauerkraut the lactobacilli and healthful enzymes have been destroyed. As long as they are refrigerated and eaten within six months of being created, Raw Cultured Vegetables are a flavorful self-sustaining culture of these essential enzymes and lactobacillus cultures that do not dissipate with shelf life, like some probiotics and acidophilus powders. On March 10, 1989, Dairy & Food Labs, Inc. found 5,500,000 lactobacillus acidophilus per gram in our Vegi-Delite Live Zing Salad, made with organic raw cultured cabbage, beets, carrots, lemon, dill and garlic. This is not an isolated, refined supplement (where lactobacillus count tends to dissipate) but an appetizing live food that is naturally self maintaining its fresh lactobacillus count. Candida is a commonly used term to describe the overgrowth of and subsequent health problems caused by the naturally present yeast, albicans candida, in the human digestive tract. In healthy humans, the extent to which candida proliferates is usually kept to a minimum by the lactobacilli and other healthful micro-organisms. Sometimes as a result of antibiotics and certain toxic aspects of our environment, the healthful micro-organisms get diminished. This results in an increase in the candida and leads to health problems such as: dizziness, absent-mindedness, digestive problems, grumpiness and/or irrational behavior. Raw Cultured Vegetables are rich in lactobacilli, including plantarum and acidophilus, which help to create a healthy colonic environment in which yeast populations, and pathogenic bacteria are controlled. Raw Cultured Vegetables are especially good for people taking antibiotics or birth control pills, pregnant women, and diabetics; all high risk groups for yeast disorders. Raw Cultured Vegetables have been effective in the treatment of a number of other disorders, including: peptic ulcers, ulcerative colitis, colic, various food allergies, cystitis, vaginal infections, constipation, stomach-aches and other digestive disorders. I received a letter from one individual with ulcerative colitis saying that Raw Cultured Vegetables saved their life. Another person's testimony is: I had been ill with what was diagnosed as ulcerative colitis and had a few bad episodes with it. About a month ago I found Vegi-Delite (Raw Cultured Vegetables made from cabbage, beets, carrots, dill and garlic) which contains the active lactobacillus culture. Within 3 days of use my symptoms had cleared, and I have been well since. Raw Cultured Vegetables are made from cabbage, a cruciferous vegetable, and other natural ingredients. The American cancer Society's epidemiological studies indicate that diets high in cruciferous vegetables have been associated with less cancer incidence. Paul Pitchford, in his book, "Healing with Whole Foods", states, raw saltless sauerkraut... promotes better nutrient absorption as well as the growth of healthful (acidophilus) intestinal flora. In the context of such a beneficial ferment, gastro-intestinal renewal is enhanced; in addition all the properties of cabbage become more effective (page 379). Dr. Johannes Kuhl, a German doctor and author of several books including "Cancer in Check", repeatedly found evidence that the regular consumption of Raw Cultured Vegetables works as a preventative measure for cancer patients. Raw Cultured Vegetables also combine well with just about all foods (the exception may be fruit, although I have received reports that the culturing of the vegetables lets them be compatible with fruit), and aids in the breakdown of both carbohydrates and proteins. Various pleasing taste sensations can be experienced by experimenting with Raw Cultured Vegetables on and with all different foods. Donna Gates, in her best selling book The Body Ecology Diet, thoroughly discusses the importance of Raw Cultured Vegetables in digestion: Cultured vegetables...are already pre-digested. This means that before they enter your mouth, the friendly bacteria have already converted the natural sugars and starches in the vegetables into lactic acid, a job your own saliva would do anyway. The enzymes in cultured vegetables also help digest other foods eaten with them, (p. 92). In the book "The Macrobiotic Way", Michio Kushi defines the principle of Yin and Yang as the philosophical foundation of macrobiotics. He goes on to say that the unifying principle states that everything in the universe is constantly changing and that antagonistic forces compliment one another. An understanding of this principle promotes harmony of body and mind and helps individuals to achieve balance with the natural world. The definition of Yin and Yang is as follows: "Yin - energy or movement that has a centrifugal or outward direction and results in expansion. Yang - energy or movement that has a centripetal or inward direction." In terms of Yin and Yang, Raw Cultured Vegetables are a beautifully balanced food. They're Yin in that their primary ingredient, cabbage, grows above the ground and the outer leaves expand out. The outer and inner leaves are soft when they are broken away from the compact center. It is Yang because the inside of the cabbage is compact and hard and it grows close to the ground. Based on how Michio Kushi defines macrobiotic foods, Raw Cultured Vegetables are macrobiotic because they are conducive to maintaining one's lean "Yang" appearance. They fulfill the pickled vegetable category he recommends in his diet and supply the beneficial enzymes and easily digestible fermented foods he discusses. The human digestive tract, including the colon, intestines, saliva, and pancreas, is in it's proper and healthful balance when there is a preponderance of healthful micro-organisms including lactobacilli. An important aspect of keeping this proper balance is to keep lots of fresh, live enzymes in the digestive tract. The concept of macrobiotics means an overall balance. When related with the human digestive tract it includes an enzyme balance and the proper balance of living micro-organisms. Raw Cultured Vegetables will balance the strong, warming winter foods with light and lively enzymes and in the summer, will supply you with the light food requirements macrobiotics indicate are appropriate. Cooked vegetables are macrobiotic because the cells get broken down from the cooking and nutrients are more easily assimilated. Raw Cultured Vegetables are macrobiotic as cooked vegetables are macrobiotic because the fermentation process breaks down the cells of the vegetables, just as cooking does. But since no heat is used, Raw Cultured Vegetables can still supply our bodies with a healthful balance of enzymes and micro-organisms. If, when we are young, we mess up our proper micro-ecological balance, our bodies may not show or notice the negative results because the pancreas can produce the necessary enzymes. Our bodies are still young enough to compensate and rejuvenate themselves from their own inherent growth powers, similar to the way a seed can sprout from its own inherent energy without getting any nutrients. Yet if you don't put that seed in healthy soil, it will lose its vitality, and eventually die. In humans, the unhealthful micro-organisms including candida and E. Coli, emit toxins and may thrive in a digestive tract that does not have a preponderance of healthful micro-organisms, including lactobacilli. As one gets older, these toxins may seep out through the intestinal walls and poison the body, creating what the famous Russian scientist Elie Metchnikoff (Metchnikoff was appointed by Louis Pasteur to run the Pasteur Institute in France and continued on in that capacity after Pasteur's death) referred to as "auto-intoxication." Auto-intoxication is the poisoning of the organs as a result of toxins or poisons building up in the intestines and then eventually seeping through the cell walls of the intestines and entering the blood stream, the lifeline of our organs. When you're young, your organs can still function well with toxins in them. The negative results are noticed as you get older. When the organs become poisoned, their ability to assimilate vitamins, minerals and other nutrients and to rejuvenate the body is diminished. Many people who are older can have a lot more energy and be a lot healthier if they prevent auto-intoxication by keeping the proper micro-ecological balance in the digestive tract. In the digestive tracts of human babies and wild animals, there exists a natural microbiological balance. This means there is the right amount of healthful micro-organisms present. Originally, nature designed the implantation of these healthful micro-organisms to occur as a result of the consumption of mother's milk. Nature designed our bodies to keep this proper microbiological balance (healthful micro-organisms proliferating in the digestive tract) for our entire lives without needing to be re-implanted. Nature did the best it could to compensate for overprocessed, fiberless diets, antibiotics, and/or a toxic environment (all of which may eliminate vital micro-organisms) by giving our bodies inherent strength and a natural resiliency. If these healthful micro-organisms are eliminated, one of nature's methods for re-implantation of the vital micro-organisms is the consumption of Raw Cultured Vegetables. An enzyme is a biochemical: a minute chemical that performs a specific function when in the proper environment for that enzyme to perform that function. In effect, certain enzymes do certain things at different temperatures with and without water and/or air. Additionally, certain enzymes work on certain substances. An enzyme works when in the appropriate environment that lets its active center merge with the molecules of a substance (food, vitamins, minerals, etc.) and create a chemical change, which transforms the molecular structure of the substance. There are thousands of different enzymes performing many different functions in every living metabolic action. Enzymes are life in action and life is enzymes in action. The biggest difference between an enzyme and a micro-organism is that an enzyme does not grow or reproduce. It simply catalyzes other substances in order for them to grow, reproduce, function or metabolize. Micro-organisms, including lactobacilli (the plural of lactobacillus), consist of enzymes and cells. I got a better conception of what a micro-organism is from a scientist who described them as being kind of like a little bag of enzymes. The lactobacilli transform sugars into lactic acid. This is done via enzymatic actions. These enzymes ooze out through the cell walls of the lactobacilli to do this job as well as doing it within the cell's walls. Since lactobacilli are alive, they are full of enzymes. These enzymes continue to do this same job inside the human digestive tract. As new micro-organisms are created, new enzymes are created. These micro-organisms are made of enzymes and cells. Thus, fermented vegetables have more enzymes than regular cabbage, especially when they have been kept well refrigerated after six days of fermentation. This is assuming these fermented vegetables were not heated, as heating eliminates enzymes and the healthful lactobacilli. Since it's alive, the human body functions and metabolizes from enzymes and enzymatic actions. That's why it's so beneficial to feed your body enzyme-full Raw Cultured Vegetables. Your body's organs, especially the pancreas, produce enzymes for the purpose of digesting food as well as for the purpose of supplying your organs the enzymes that they need. But it's still important to get fresh enzymes in the diet because our pancreas and other enzyme-making organs as well as the metabolic processes of the body need a chance to rest. More importantly, these organs need a chance to make enzymes that vibrantly catalyze the natural refurbishing of our cells. This is especially true when organs have been overused, producing enzymes to process overwhelming amounts of bulky refined foods that take away digestive juices and give nothing or little back to the body's health process. Nature designed people's enzyme-making processes to be used for the purpose of normal metabolism: rejuvenation of cells, elimination of toxins, growing, and strengthening of the immune system, with a minimum enzyme-producing requirement for digestion. This has been scientifically proven, and it makes sense when one considers that when nature designed the human body there were no refined or processed foods and there was a minimum of cooked foods. Yet raw and live foods full of enzymes were plentiful. This is why it's so important to eat enzyme-full Raw Cultured Vegetables -- so your body has a chance to make enzymes to rejuvenate itself and not waste a large portion of its enzymes digesting food. There are in nature, i.e., the air and plant life, including cabbage leaves and other vegetables, many different micro-organisms, including lactobacilli and other bacteria. While a few of these bacteria permeate the leaves, most stay on the surface. If cabbage is ground up, put into a sanitary container, and left at room temperature (60-70 degrees), leuconostoc mesenteroides (one of the naturally present bacteria in vegetables) rapidly colonizes, quickly lowering the pH (creating an acidic environment) of the now fermenting vegetables. In this environment, healthful micro- organisms, including lactobacillus plantarum and lactobacillus brevis, can proliferate. This means these micro-organisms, via enzymatic actions, are converting sugars and starches, which are naturally present in vegetables, into lactic and acetic acids (natural preservatives). This maintains a slightly acidic healthful environment in the fermenting vegetables that continues to be conducive to the proliferation of healthful micro-organisms. When fermenting vegetables are packaged and put in a refrigerator after fermenting for six days at room temperature, they are at the peak of the conversion process (converting the sugars and starches in the vegetables to lactic and acetic acids). In other words, these healthful micro-organisms are having a "real party!" They are reproducing, growing, and converting the naturally present sugars and starches in the vegetables. This process continues when the fermenting vegetables are refrigerated, but at a much slower rate and, if they are kept just above freezing, they are barely fermenting at all. Yet when you bring the cultured vegetables back up to room temperature, the whole process continues. Therefore, when you put these fermented and/or fermenting vegetables that are at room temperature on food that you're eating, the conversion process, which is similar to human digestion, is happening as you put the vegetables in your mouth and chew them. Because digestion is being initiated sooner, the flavors of all the foods are released sooner and in a more complete and healthful way (a "live zing" taste sensation). An interesting phenomenon is that in our digestive tracts, a similar thing occurs as occurs during the fermentation of vegetables, i.e., our digestive tracts have lactobacilli and other healthful micro-organisms converting foods including sugars and starches to lactic, acetic and other acids. In this environment, human digestive tracts normally do not let unhealthful micro-organisms such as candida (a yeast) proliferate. This exemplifies how natural the consumption of Raw Cultured Vegetables is since Raw Cultured Vegetables do almost the same thing as our digestive tracts. Use fresh, well-cleaned cabbage either on its own or as the primary ingredient along with beets, carrots, garlic, celery, kelp, herbs or any other vegetable you enjoy. You may add a high quality sea salt if desired. A five-gallon container will hold about 35 pounds of vegetables and it is best to use at least 25 pounds per recipe. You can either grind the vegetables using a Champion Juicer (without the screen) or cut and shred them with a food processor. If you use the latter process, pound the vegetables to make them juicier. Put the prepared vegetables in a stainless steel, ceramic or a glass crock. Don't fill the crock to the brim because the fermenting vegetables are likely to expand and may overflow. Put lots of fresh cabbage leaves on top of the ground up vegetables and using your hands and a little body weight, gently and firmly compress the leaves. Put a plate that is as wide as possible in the crock and then add some weight to the plate, such as a lidded glass jar filled with two-thirds of a pint of water. A little weight will be sufficient, as too much will force the vegetable juice above the fermenting vegetables. Check the fermenting vegetables a few times over the next day and a half to ensure that the plate is sitting evenly on the vegetables and is not lopsided. Let the fermenting vegetables sit in a well-ventilated space at room temperature (between 59-71º) for five to seven days. The longer it sits the stronger it gets. After five to seven days (6-7 days at 62ºand 5-6 days at 70º), throw away the old cabbage leaves and the moldy and discolored vegetables on the top. Put the remaining delicious fermented vegetables in glass jars and refrigerate. The Raw Cultured Vegetables will last from four to eight months when kept at 34º and opened minimally. Do not freeze them. If you don't have the time or the inclination to make your own Raw Cultured Vegetables, you may want to consider trying Rejuvenative Foods Raw Cultured Vegetables which can be commonly found in refrigerated sections of natural food stores. Rejuvenative Foods produces four different delectable flavors of Raw Cultured Vegetables: Vegi Delite Live Zing Salad (cabbage, beets, carrots, lemon, dill & garlic), Fresh Raw Kim Chi (cabbage, carrots, onions, ginger, high mineral sea salt & ground dried red peppers), Flavor 1 Raw Sauerkraut (just cabbage & dill) & Sea-salted Raw Sauerkraut (macrobiotic sea salt & cabbage). These inviting foods are made from fresh raw organic vegetables and are refrigerated and dated because they have not been heated like most commercial sauerkrauts. Raw Cultured Vegetables are delicious and provide an excellent self-rejuvenating source of non-dairy lactobacilli, including acidophilus and plantarum, important for the maintenance of healthy intestinal flora and the alleviation of digestive disorders. This is important for people who are lactose intolerant, have pathologies that prevent the consumption of dairy or simply choose to avoid it. If you would like to learn more about Raw Cultured Vegetables, there are several books that discuss the topic in more depth. They include: Donna Gates' The Body Ecology Diet, Paul Pitchfords' Healing with Whole Foods, and Conscious Eating, by Gabriel Cousens, M.D. Dr. Cousens affirms the healthful benefits of Raw Cultured Vegetables: One way that the cultured vegetables are so good for us is that they prevent the yeast, albicans candida, and pathogenic bacteria from taking over the colon and creating endotoxins which suppress the immune system. In essence, they create a micro-ecological balance in the colon that helps maintain health. Enjoy and be healthy. Enzyme - A biochemical that catalyzes life by merging with substances and transforming their molecular composition. Enzymes are life in action and life is enzymes in action. Lactobacilli - The plural of lactobacillus. A bacteria. There are over thirty strains of lactobacilli. Many healthful and friendly lactobacilli are naturally present in Raw Cultured Vegetables and in our digestive tracts. Microecology - Having to do with the balance of micro-organisms and their relationship with their environment, especially in the human digestive tract. Micro-organisms - Microscopic living organisms, including bacteria and yeast. Also known as microflora. A micro-organism consists of cells and enzymes. Permission is given to reprint and distribute this article.